Celebrated and veteran photographer Lynn Goldsmith, in conjunction with top shelf (no pun intended) book publisher Rizzoli, has compiled and released an excellent presentation of the band KISS during their height of popularity, that being 1977 through 1980. With access and trust being key for successful photography, (in addition to the obvious talent, creativity and eye) Goldsmith had that access in spades with the band. While incorporating her own compelling ideas and gifts in her craft, Goldsmith was able to capture stellar images of this highly theatrical and visual group of four distinct personas that comprise KISS. This includes many candid, behind the scenes photos, and a nice mix of color and black and white. Additionally, Goldsmith worked with founders Gene Simmons and Paul Stanley in having them provide current written commentary throughout the book. They had a very good rapport, being about the same age and sharing Jewish roots. An added plus is that although KISS is from New York City, they first broke in Detroit, a city that truly loves their rock and roll. Goldsmith is from that city and can relate to it all. Relating to a photographer’s subject is important, as it not only allows for an effective exchange but also interesting ideas, which Goldsmith has many, especially with KISS. 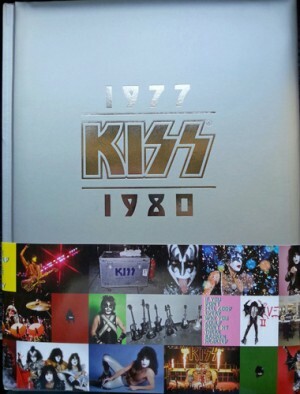 This large sized, silver colored book of a few hundred pages is an essential addition to any KISS fan and/or of rock and roll based photography. Highly recommended!